As amazing as NFL2K1 is, there are still a handful of things which need to be improved or corrected. For starters, NFL2K1 doesn't do the best of jobs handling stats. There are no career stats for players on your team, nor is there a way to view free agents' prior performance. The game simply will not show you the final season stats in the franchise mode, and the Player of the Game is nominated but never accompanied by the stats which put him on the screen. Although the players' ratings are carried over from season to season, any specific stats get discarded with each year. There are also no stats available for players online, which would have been nice. Although the game is still a great simulation just the same, this is something which really needs to be addressed for next year's release. I also hope Visual Concepts gets the referees some glasses, because they can really botch a call. I've seen a referee call an incompletion on an obvious touchdown pass while another guy got smashed on the second yard line, but the ref ruled it a touchdown. Pass interference doesn't seem to be that big a deal in NFL2K1, and my opponent wasn't called on it even though he flattened my wide receiver before the ball was even ten feet away. While I was able to make adjustments in the penalties menu (would you believe they've included excessive crowd noise penalties?) to make harsher calls on pass interference, the other rulings are just bad. Yeah, the people on the sideline still look like crap. This isn't a major problem (I only witnessed it online), but it just shouldn't be there at all. I'd chalk up such rulings to a few loose bugs. There is another bug where you can accidentally crash the game depending on what you input into the controller while using the VMU play calling. Although overall NFL2K1 is far from buggy or rushed, stuff like this needs to be fixed for next year. I can also nitpick some of the visual shortcomings, few as they may be. I still don't care for the invisible walls around the field that the ball hits about two yards out of bounds. And while the players have tons of animation and detail, they could still use some more work on their beef jerky-like arms. The arms lack definition compared to last year's models (although the textures are much improved). And speaking of models, whatever happened to cheerleaders? Those would be nice to see next year. And speaking of pretty and useless, the game menus have improved, but still need more work. Having to use a button to scroll through a selection is just wrong, and only being able to select one team at a time is also dumb. Also, it's not really the game's fault, but the Dreamcast can certainly use some more controller ports already. Get four people on a team with a keyboard and, uh, you can't do it. The chat function operates all throughout the game and is a joy to use, but the keyboard needs its own controller port, which leaves one man out. I would go on, but all I can think of is the well done color manual, the fantastic live action introduction, the players' sliding in the snow, the amazing replays... but that's all good stuff, and this section is for bad stuff. There really isn't much bad about NFL2K1, and that's a good thing for a great game. Buy it, buy it, buy it. 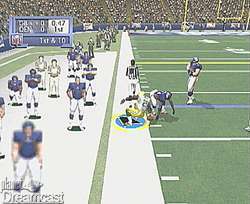 If you are a football fan, then you are a NFL2K1 fan. Although the realistic nature of the game takes a little getting used to, this game just oozes quality, and gets better over time. 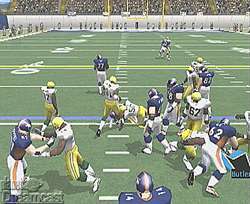 It's a near perfect football game, a great way to kick off SegaNet, and a perfect alternative to Madden. Highs: Amazing AI, incredible online features, great presentation, options galore. Lows: A handful of bugs, poor stat tracking, bad but attractive menu design. Other: 1-4 Players, VMU Compatible (163 blocks), VGA Box Compatible, Jump Pack Compatible, Keyboard Compatible, Modem Compatible.